Thanks to Veryn’s efforts, Counties Manukau Police have recently been able to arrest a prolific offender in the area and charge him with six shoplifting offences. 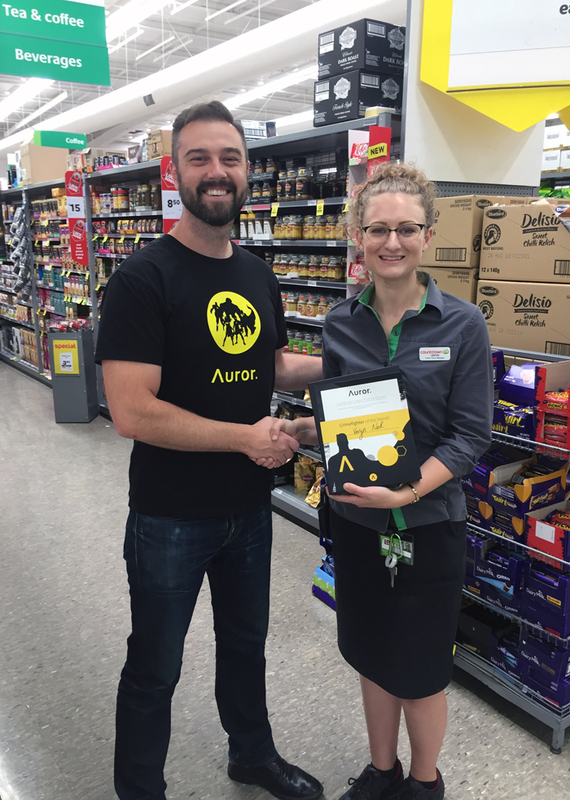 The nomination for Veryn this month came from one of her colleagues at Countdown, citing her consistency in using the platform and describing her as a ‘real champion’ for the difference Auror can make. She’ll upload incidents quickly (often within an hour of occuring), and adds nice, clear descriptions of the event with all the footage. Bravo Veryn! Kevin Ptak from Auror presenting Veryn Nell with her Crimefighter award. Hi Veryn! How is Auror helping you be more effective in your role? Knowing who to look out for helps us prevent incidents before they happen, and be more aware of the methods used to steal so we can manage situations better. How have you managed to be successful using Auror? I try to upload every incident and do it as soon as possible. I like to check the Feed on my days off as well to keep up with what's going on, and scrolling through the Feed regularly has helped me link a lot of offenders from my store to their other offences. Why do you think it's important to reduce crime? I want my workplace to be a happy and safe place for my team and customers. The repeat offenders often get more bold and dangerous the more times they return so we really want to stop them before they escalate. Be detailed from the start, even if it seems minor. It's really hard trying to go back and find footage or remember details for an incident that happened months ago. Sometimes it does take a long time to get prosecutions so giving as much information as possible to start with saves a lot of effort later. Do you know someone that deserves special recognition? Let us know and they may be featured next month!